Update, 6:15 p.m.: State water officials say they be forced to continue using a badly damaged spillway at Oroville Dam to prevent the lake from reaching capacity in the next few days. Doing that would like cause further damage to spillway structure and continue eroding the surrounding area, Department of Water Resources spokesman Doug Carlson said Wednesday afternoon. But that could be preferable to allowing the lake to begin flowing over an emergency spillway on the dam. “It’s an outcome that DWR is committed to not allowing to happen,” Carlson said. Like other DWR officials, he was quick to add that the spillway damage does not pose a threat to the dam itself, one of the largest ever built in the United States. The department conducted an experiment during the day Wednesday in which it began sending a limited amount of water — about 20,000 cubic feet per second — down the damaged concrete spillway structure. The purpose of the test, Carlson said, was to see how much additional damage was done. The DWR’s spillway test came as Lake Oroville, the state’s second-largest reservoir, is filling rapidly with runoff from recent storms. In order to maintain enough space in the lake to accommodate in-rushing floodwaters, managers would normally release water down the dam’s massive concrete spillway. That was just what was happening Tuesday when bystanders alerted dam personnel that there appeared to be damage to the structure. Releases that were being ramped up to about 60,000 cubic feet per second were abruptly halted so that Department of Water Resources crews assessed the situation. In the meantime, a high volume of runoff into the lake has continued, raising it more than 20 feet since early Tuesday. Late Wednesday afternoon, the reservoir was just 30 feet below an emergency spillway that has never been used in the dam’s half-century of use. Things tend to break at the worst times. Doesn't look like a cheap fix either. It's called preventive maintenance for a reason. The "investigation" will find out "they" knew about the potential problem for months/years. It will find out "they" couldn't find the funds, or yada yada yada. It will find out they are now looking at a potential catastrophic dam collapse, or at minimum serious economic damage from spillage problems, or lack of water because they have to dump it over the defective spillways. Yep, GOVERNOR MOONBEAM IN ACTION. Government never seems to spend money on routine maintenance, and always waits till a disaster is nearly upon us before they do anything. Look at the link, pictures and video! That spillway is going to self destruct by sheer force of the water. They may have to rebuild it when dryer times arrive. They "think they have it under control". That's funny. Assuming you need dry weather to work on dams, well they just had a drought for several years, which would mean it was cheapness, stupidity and corruption that prevented repair work from being done. Arnie did such I fine job too, NOT! Unfortunately this seems to be a "Good" part of CA. Every Time History Repeats Itself The Price Goes Up. You can tell just looking at it that sending more water down it will further damage it. Duh. 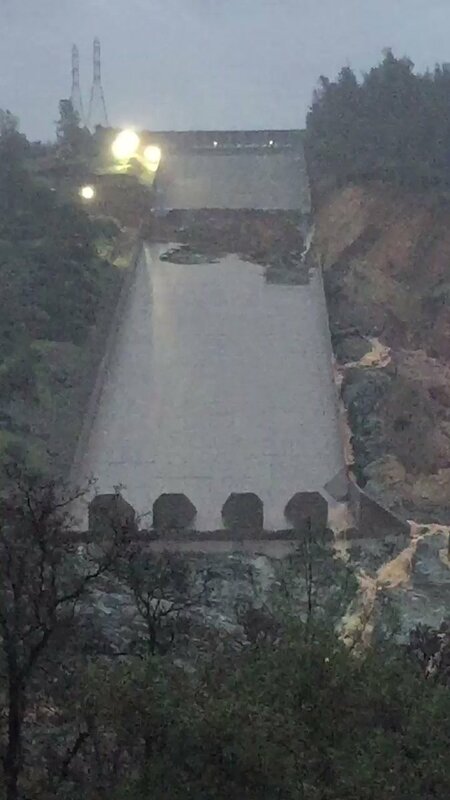 Well, the politicians in California should have spent the money to repair this spillway instead of funding more illegal immigrants to come in and vote for Hillary. If California asks the feds for money to repair this, then President Trump has leverage on their stupid sanctuary state. Use it! the term "withholding federal dollars until compliance" comes back to bite them. but how many will while the state hems and haws.? Any idea how far the water from a catastrophic collapse would travel? Maybe all the way to Sacramento and wash out all the corrupt politicos? I'm not sure whether or not this particular damage was due to lack of maintenance, but I understand from CA posters that the water infrastructure in CA has not been maintained properly or updated for decades. Time to pour money into it, lots of it. They have big problems coming at them. The weather loop below shows a lot of rain heading to that drainage basin. The spillway is about 3000 feet long and 180 feet wide. It will take over 9000 cubic yards of concrete to plug that hole if they pumped it full. As far as maintenance, they should have recalled or may have forgotten soils 101. In dry periods, clay and silty soils shrink, and expand when wet. The drought had a prolonged dry spell and soil in the area shrunk and cracked, as evidence by the lake bed. Then to turn on the spillway without an hammer test when it was dry was a huge mistake. A simple hammer sounding will reveal hollow areas beneath the concrete. The basin is taking in about 135,000 cfs, and the out flow through the power turbines is only about 15,000 cfs if they are not down for maintenance. They will soon lose the ability to regulate the outflow, and will have no choice but to open the spillway again, hope for the best, and fix it in the spring when it dries up a bit. The spillway is not in the portion of the earth and rockfill dam, but on native soil, so the dam is not in jeapordy. Look at google earth and you can see the fill area of the dam vs. the spillway. i used to live in oroville from the 80's to the early 90's and i can tell you all with out a doubt if that dam goes oroville will be completely gone..
there will not be a stick left to pick up some parts of the lake behind the dam are over 20 miles long and there are places where it is 600+ feet deep. as for the spillway where it empties in to the feather river there is a road on the other side of the river across from it. i have seen water from the spillway jump the river bank on the side opposite from the spillway and land on the road closing the road. so for the spillway to be damaged that bad it had to have an excessive amount of water going thru it more than it was designed for. here is a picture of what i am talking about you can see the roads in the bottom left that i have told you about in this picture they would be closed. just found some video about what is going on at the oroville dam spillway..
and one more that i have found. Last edited by byronandkathy2003; 02-09-2017 at 09:53 AM. The spillway is broken partway down the hill. If they put more water through it, it looks to take out everything downhill from the fracture. The ground will scour out, and they'll have something like a waterfall the last few hundred feet. The turbulence from that will cut backward up the hill, so it will be a race with time to see if the water can be stopped before it reaches the top of the spillway. FEMA grants? That is only for the States that don't openly flaunt existing law. To wantonly break the law on one hand and have the other hand held out to beg money won't work with this President I don't think. Ignoring problems until they become a crisis, then expecting federal dollars for a fix. Leaves a lot of money to support the gibsmedats. Simple math... Every moment they don't have the broken spillway flowing, is more water on the wrong side of the dam. More water on the wrong side of the dam is just going to make the situation worse when their hand is forced by rainfall and gravity. Somewhere, there is a decision maker who is more concerned with saving face and bad policy, than with making the best of what should have been an avoidable situation. Perhaps they should convene a gender studies conference in the visitor center, so a "Progressive" solution can be applied to the problem... I'm sure this is all the fault of xenophobic white Republican men. Any guesses from knowledgeable people on how long this would take to fix, with perfect weather of course. Perhaps they should convene a gender studies conference in the visitor center, so a "Progressive" solution can be applied to the problem. I want the spillway fix to demonstrate respect for the contribution of black women to the project. The concrete used should come from small businesses run by LGBT owners, and the design should express how Muslims can feel better about themselves. Oh yeah, and if it actually works, that would be ok too. Methinks they have a problem... The erosion is moving UP the spillway. Somewhere, there is a dam admin soiling his undergarments. I'd be packing my bags and moving now if I were living below the dam. all states are equal, except california is more equal than others. Spillway now toast, completely breached. Collapsing. Scroll down to Sean Bennet's video from 3 hours ago. Major disaster. The current situation is in California - but I am 99 percent sure there are a lot of other dams, bridges, roads and the like ALL OVER the US in similar states of non-repair just waiting for the next "weather event" (this one could have been predicted by anyone whose lived in California for more than a couple of decades) or other natural/man-made disaster to collapse. So yes, laugh if you like and have fun dragging Governor Moonbeam through the mud - he's an easy target I'll grant that; but the lack of funding to "fix things" has gone on since just a few years after they were built mostly between 1930 and 1970; with States, Counties and the Federal Government all playing a massive game of "chicken" with aging and creaking infrastructure. I do hope that Trump follows through on his promises to try to do something about this; even setting up a new WPA if he needs to, both to employ people and get the work done. Meanwhile, if I lived in this fairly CONSERVATIVE part of California I'd be packing my bags and going to stay with friends if I could; at least until the rain stopped (not likely for at least another month). A lot of people though are going to be stuck for work or family reasons; I hope the local officials have the guts to call a mandatory evacuation if it really looks like the dam is going to go; otherwise a lot of people are going to die. WOW!!! The people downhill from that need to get out of harms way and now! Like I said earlier, now it's a race with time. It will eat its way uphill until it undermines the spillway gates. ETA: Looks like it has a good chance at taking out a power line too. Wonder if that line is critical to dam operation. Plenty of money for fat pensions, but not enough money to prevent the next Mullholland's Folly aka the next St Francis Dam disaster. Figures. There was some concern a couple of years ago about the Medina River dam west of San Antonio some years ago. It is a hollow masonry type dam built around 1911. If I lived anywhere near its path I would evacuate NOW. Right this minute! Cannot find a link to these statements but interesting. CA Dept of Water Resources employee: "Something is gonna blow"
"If the rains continue for another week, we are going to have multi system failures, levees, dams, storm drains are ready to give"
Recommends getting valuables out NOW in floodplain areas of N Cal. "Nothing has been done to repair known levee weaknesses due to environazis and their red tape"
"a multi system failure initiated by oroville uncontrolled release will cause flooding on a scale never seen before in the USA"
Too little, too late. What's left of the spillway will probably be gone in an hour, once they are forced to keep the gates open. It sounds like they might have 48-72 hours before the lake crests the "emergency" spillway, even with the current one running full blast. Don't wish them any harm, but I'd love to be there in person and feel the ground shaking. What a show. !!!!!!!!! This time the DOOM is reality. I don't see anything like that at your link. Please post a picture and a link so we can verify what you are calling "toast" and "completely breached". The water is currently going UNDER the spillway.